Higher levels of health and wellness can be obtained when we realize that we are so much more than just a brain and physical biochemical body. For thousands of years, Ancient scholars and physicians from civilizations across the globe knew about the subtle energy systems that are integral to our existence and health. Prana or Chi is the life force that sustains our subtle body. This prana is derived from the quality of food and water we consume, the quality of air and quantity of breath we intake, in addition, prana is received through channels called Nadis. There are 72,000 nadis which coalesce prana into the central sushumna channel and chakra system. Chakras are energy vortexes that transfer and process life energy. The word Chakra means wheel or vortex in Sanskrit. The primary 7 chakras along the spine support specific body regions, organ systems, nerve plexuses, endocrine systems and emotional frequencies. The vibrancy and activity levels of chakras can be hypoactive and constricted or hyperactive due to situations such as physical trauma, illness, emotional stress and toxins. 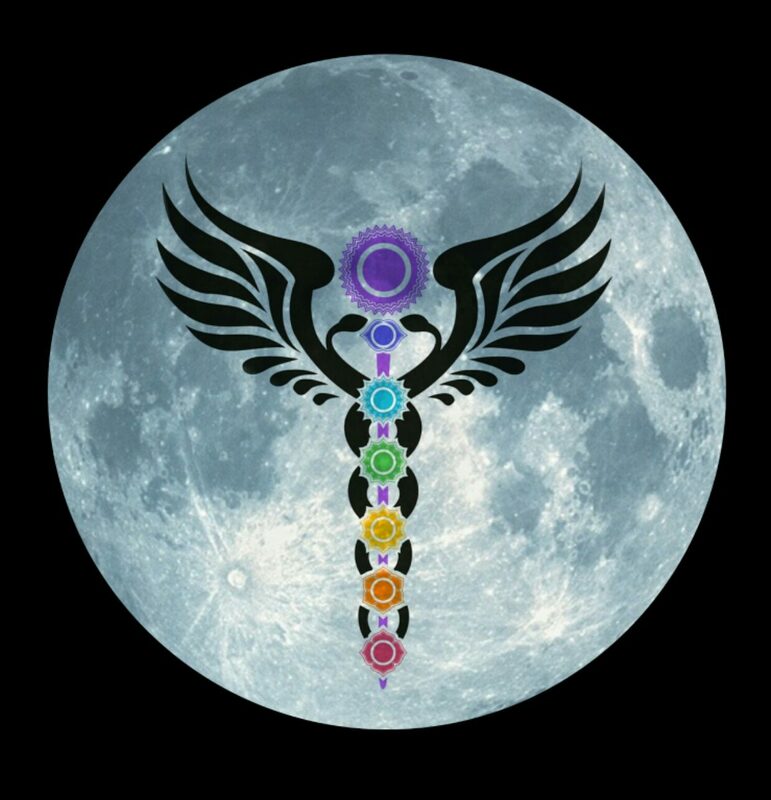 Keeping the chakras activated and unconstrained is key to optimal health and ascension of kundalini energy. Optimal chakric function can be achieved through proper practice of yogic asanas (poses), pranayama (breath work), meditation, mudras, mantras, reiki healing, cognitive reprogramming and healing vibrational frequencies. The first of 7 chakras is the Muladhara chakra, located at the base of the spine. Muladhara means Root and is related to survival, instinct and safety. When activated and balanced, the Muladhara chakra supports abundant health, energy, satisfaction with life feeling grounded, safe and secure. This chakra supports and provides prana to the colon, adrenals, low lumbar spine, pelvis, hips, legs and feet. The Svadhishthana chakra is located above the pubis bone and below the naval. Svadhishthana means Sweetness and is related to creativity, sensuality, passion and self nurturing. When activated and balanced, the Svadhishthana chakra supports our sense of self boundaries, self expression, creativity and social skills. This chakra supports and provides prana to the low abdomen, urinary system, reproductive organs and mid lumbar spine. Moving just above the naval we locate the Manipura chakra. Manipura means “lustrous gem” and is related to self discipline, confidence and a warm personality. When activated and balanced, the Manipura chakra supports our sense of responsibility, humor and ability to achieve. This chakra supports and provides prana to the stomach, liver, pancreas and mid spine. The Anahata chakra is at the heart center. In Sanskrit, Anahata means “unstruck’ and is related to love, compassion, nurturing and healing. When activated and balanced, the Anahata chakra supports our ability to love ourselves and others, to have empathy and radiate inner peace. This chakra supports the chest, thoracic spine, shoulders, arms, hands, lungs, thymus, heart and circulatory system. The Vishuddha chakra is at the throat center. In Sanskrit, Vishuddha means purification and is related to the ability to communicate and express oneself . When activated and balanced, the Vishuddha chakra supports communication skills and ability the to be truthful. This chakra supports the neck, throat, esophagus, jaw, tongue and thyroid gland. The Ajna chakra is located at the third eye. In Sanskrit, Ajna means to perceive and is related to wisdom, insight and psychic abilities. When activated and balanced, the Ajna chakra supports imagination, optimism, wisdom and 6th sense. This chakra supports the eyes, ears, face, brain, hypothalamus and pituitary gland. The Sahasrara chakra is at the crown of the head. In Sanskrit, Sahasrara means 1,000 fold and is related to higher planes of consciousness When activated and balanced, the Sahasrara chakra supports our sense of spirituality, faith and connection to the divine. This chakra supports the pineal gland and nervous system. All the chakras interact and support each other when activated and healthy. To enhance chakra radiance, eat a balanced clean diet rich in prana, drink clean pure water that is fluoride free, keep the body fit with yoga asanas and exercise, practice pranayama, avoid toxins, minimize stress and perform the chakra activation meditation regularly. If you are interested in a guided chakra activation meditation practice, the Chakra Activation CD guided meditation is available on Amazon, CDBaby, Spotify, ITune, IHeartRadio, InsightTimer and most other digital platforms. Visit HealthierVibrations.com for more healthy living education, online classes and certifications.